Yesterday I felt a great need to try the Great Divide anniversary IPA, which is a beer I missed during the GBBF. Following Pete Brown’s tip, I headed to the White Horse in Parsons Green for their American Craft Brewing celebration in the upstairs bar. I like the White Horse– it’s comfortable yet elegant and the service is always stellar. Yet, I never know what to eat there as the menu is strictly gastro and full of things like “deep fried lamb’s tongue.” I end up Googling things like “Haslet” only to find out it’s made of pig hearts. I have heard the food here is very good, and I’m sure it is, but it’s not my kind of thing, and I didn’t try any of the vegetarian dishes. The veggie options at places like this are usually a gloopy risotto or some salad involving warm goats cheese– an afterthought. The 7-10% beers are sold in halves or pints instead of the more reasonable third-pint measure, which meant I had to curtail my list a bit. After drinking so many cask ales over the last five years, I had to re-acclimate to American beers on keg. The carbonation releases hop oils and really changes the mouthfeel profoundly. And the serving temperature is much colder, which I love, but it means the real dimension of the beer reveals itself slowly, like a dance of veils, as it warms in your hand. 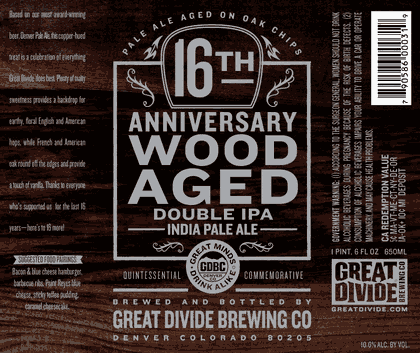 Great Divide 16th Anniversary Wood-Aged IPA was worth the trek to alien land that is posh greater West London. There’s definitely a Turkish delight thing going on, heavy on the pineapple and vanilla, but coated in hop bitterness. Complex and slick with a lively carbonation, after a half of this I was really feeling the alcohol which was very warming, even from the first sip. Until Mr. Malting showed up, I was drinking alone. There were only four blokes up there in the bar with me. They were fresh from the GBBF, all business. Philosophically, one always gets drunk faster drinking alone and this is not ideal. I need some London beer drinking buddies and I need them pronto! Ballast Point Calico Amber was the second beer I tried, as I was trying to scale things back and this was only 5.5%. It was unfair to line this beer up after the Great Divide IPA, which was the stronger, hoppier beer. The Amber wasn’t bad, but it wasn’t remarkable. The standout beer of the evening was Odell’s IPA which has been brewed according to a traditional English recipe from the 17th century, similar to the style brewed by White Shield for Pete Brown’s Hops and Glory adventure. It’s in that bold, hoppy-yet-light style but amps it in an American way. I had never had a beer by this brewery before, but after perusing their website I want to try all their beers now. The textures and illustrations on their packaging are the most beautiful I’ve ever seen– nostalgic, earthy and slightly magical, the fonts are reminiscent of that old storybook from which your gran used to read you bedtime stories. The beer itself was perfectly balanced and bright with a nice oily mouthfeel that would stand up really well to a spicy curry. I could have really used a spicy curry at that point in the evening. 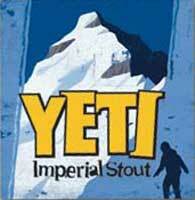 Yeti Imperial Stout is my second-favourite in this style, next to Rasputin and BrewDog’s Paradox. It’s complex yet easy to drink. I convinced Mr. Malting to have this one so I could take sips of it. He said it’s not really his kind of thing, and he only wanted a third and probably would only drink it once a year. Ok, point taken. 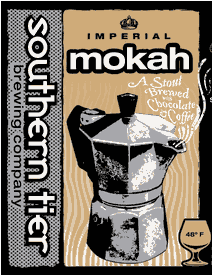 I ended with the Southern Tier Mokah, a combination of their Imperial Stouts, Jahva and Choklat. It contains both coffee and chocolate and was a dessert of a beer. Deceptively easy to drink and quite comforting, I wish I had bottles of this to give to friends who say they don’t like beer. Specifically friends who like things like Baileys or even Starbucks specialty coffees (which are weirdly popular with a lot of people I know). This would be a great gateway beer for that kind of drinker. Scattered around the bar were excellent Guide to American Craft Beers brochures published by the American Brewers Association. Well written and clearly laid out, they give the basics of beer ingredients, brewing processes and styles concisely and colorfully. 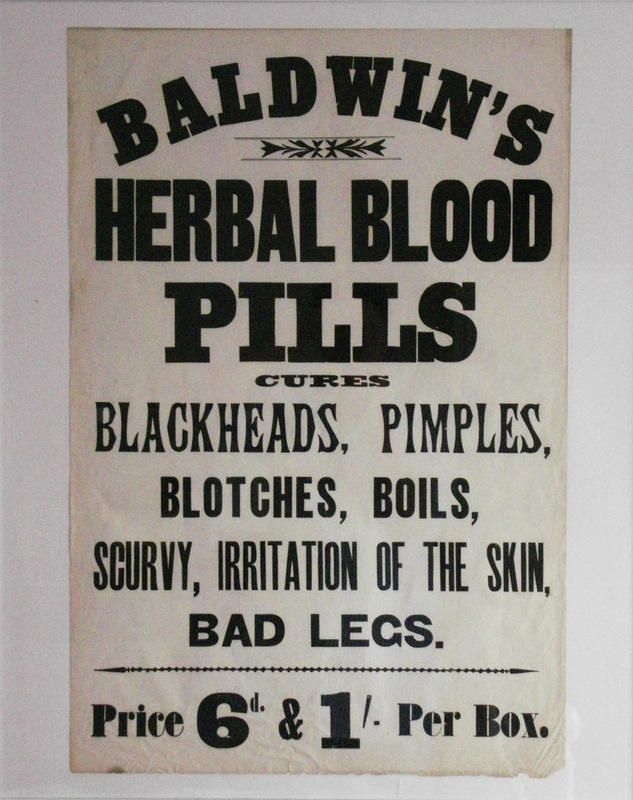 It is exactly the kind of thing I would have loved to have picked up when I was getting started, as it saves you the embarrassment of asking about the basics. The tone is enthusiastic, open and friendly, assuming no prior knowledge or expectation on the part of the reader, and yet it’s not patronizing either. 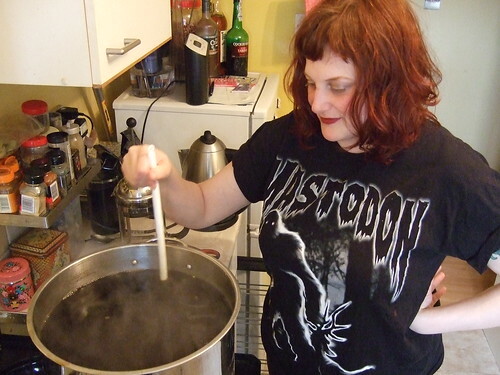 This is something I feel UK beer culture has not yet managed– how to reach out to new beer drinkers or twenty-somethings without sounding like they are passing down some hallowed tradition that must be cared for in very specific ways. 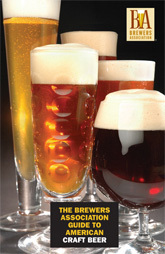 On this front– describing the joys of beer to the uninitiated– the Americans have got it right. It is difficult to do a proper evening of tasting of beers which are meant to be had in small measures, on their own, paired with food. If anyone knows a good source for US beers online, please let me know. I would like to stock up on the Mokah and Odells! It’s in the fermenter now. I remembered to take a gravity reading this time. Wooo. 1.049. Hopefully this is OK. The recipe says the gravity should be at 1.054. I was pretty fast and lose with this recipe which I found in How to Brew. It will be curious to see how it turns out. I worried about when to open it. It was so pretty, so perfectly black. What occasion could match it? 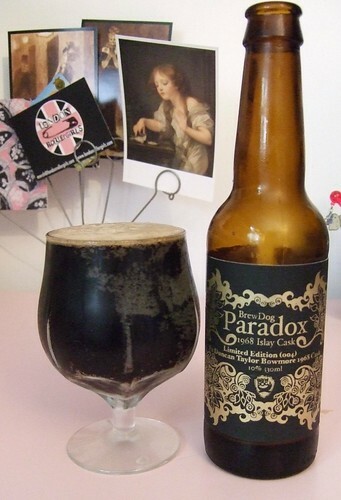 I wondered– could my bottle of LE Paradox 004, 10%, aged in 1968 Ex Duncan Taylor Bowmore casks, the most expensive beer I have ever imbibed, this bottle numbered 141 of 200 made, be its own occasion? And then all at once things conspired against my niggard’s caution. Today is Lughnasadh, the Celtic festival that marks the beginning of the harvest– really the wrong time to count beans. And it’s beer blogging friday, hosted by The Barley Blog, who’s asked us to make tasting notes on a an anniversary beer. Genius! Of course. I have met so many wonderful beer people since starting this blog; it’s truly remarkable to be in such good company. At first I worried about opening a special beer all by myself and then I realized, hey, once you’re in the beer-blog-o-sphere you never truly drink alone. The label is gorgeously florid– screen printed in gold laquer on matte black paper by Johanna Basford Designs. Out of the bottle it’s a perfect inky colour. The head is flocked, tea-stained and lovely. (There’s a beer p0rn moment where the black stream nests in the head perfectly, but of course I didn’t capture this on camera. I’m not that kind of girl.) The notes that predominate are a mysterious woody note, kindling in the nose and carpentry on the palate. There’s chocolate, too– but it’s only a shadow. The first taste is sweet but brief, prunes steeped in black tea. This glows to bitter smoke, tarnished metal and a bit of blood, and ghost-flashes of the whisky whose cask it’s shared. Five sips and it’s already warming. 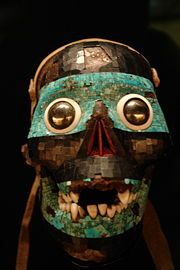 Aztec Skull depicting Tezcatlipoca, from the British Museum. It reminds me of a concoction made by the Los Angeles perfumer, Black Phoenix Alchemy Lab, who make a scent named after the Aztec god Tezcatlipoca, or “Smoking Mirror”– it shares the same notes of chocolate, armour, blood and fire. Drinking Paradox has made me contemplative. There’s an autumnal memory surfacing– late summer watching fireflies with my cousins who would break out their Barbies when I would visit (the older, creepy Barbies from the 50s–) while the adults cooked things with fire. My uncle had built a new deck and it’s the wood smell that’s bringing it all back. My hands smell like that now, in a truly Proustian fancy: the Paradox reflects this Indian Summer night from my childhood in its smoking mirror. I have had numerous beer conversion moments, with lots of false starts. The first beer I ever loved was Guinness, and the first time I had that was when I was a teenager in San Francisco. I had the flu and my Irish friend brought me a pint of Guinness and a raw onion which he said would make me feel better if I just bit into it, “like an apple.” The onion was painful but the Guinness was a revelation, as previously I’d thought all beer was icky lager. 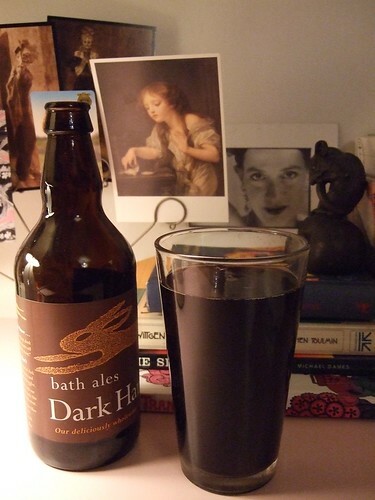 I love bath ales which I have only had on tap until now. I found a bottle of Dark Hare at Waitrose and kept it for medicinal purposes, and tonight it’s my dinner: roasty and dry with just enough bitter chocolate to be comforting. I’m skipping the raw onion.